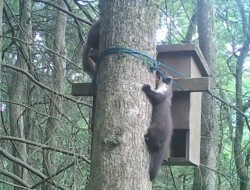 Home » Category "News Item"
Pine Marten Conservation in the UK: are there lessons for protecting red squirrels? At Westmorland Red Squirrels’ AGM on 25 May 2017 John Martin entertained us with an informative illustrated talk on Pine Martens and their relationship with red and grey squirrels. John described his research on the ecology, lifestyle and breeding habits of pine martens over the past 14 years in Galloway Forest, relating it to other research in Ireland and central Wales. We’re delighted to announce that we have been awarded a grant of £1000 by Cumbria Community Foundation to pay towards volunteer travel expenses over the next 12 months. 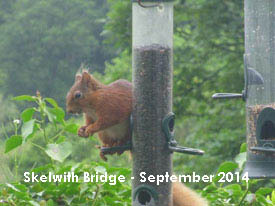 This is most welcome and will help us to provide vital conservation work to protect our red squirrels in South Lakeland. 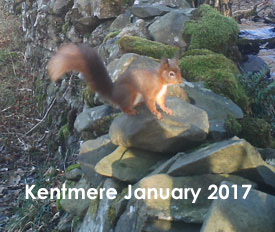 The 2016 Autumn issue of Red Squirrel News, just published by the Mid Wales Red Squirrel Partnership, brings an update on the Pine Marten re-introduction project in Wales. Just what impact are those pine martens having on our squirrels? Find out how Chris Harris is playing his part in the Pine Marten Restoration Project and get the latest news from our trail cams. A Vincent Wildlife Trust (VWT) remote camera has captured some amazing pine marten footage of a kit trying to take its first steps out of the box and then falling. Mum comes to the rescue, but is mid-lunch when it happens and she has a grey squirrel in her mouth! 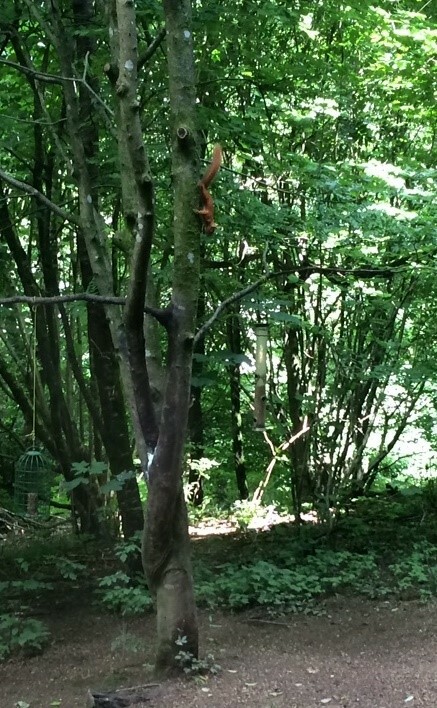 Mum drops the squirrel and rescues her wayward kit, carrying it back up the tree before returning for her squirrel. This fabulous clip>> demonstrates that grey squirrel control might be one positive outcome of the VWT’s Pine Marten Restoration Project. 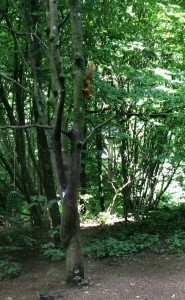 We’re delighted to report that a red squirrel has been spotted at the Lake District National Park’s Visitor Centre at Brockhole – seen near the bird hide by one of the LDNPA’s volunteers. Not only that, but Wendy Carroll has managed to photograph it! 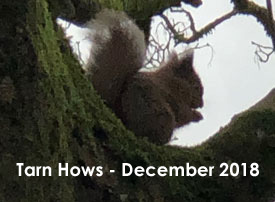 It’s been a long-held ambition of Westmorland Red Squirrels to see red squirrels back at Brockhole, and thanks to the hard work of our volunteers and the help and cooperation of LDPNA staff at Brockhole we now have the first recorded red sighting for many, many years. Well done, everyone!